R.I.P. Michael Crichton | OhGizmo! While November 4th will most likely go down in history as the day Barack Obama won the 2008 U.S. Presidential election, it unfortunately will also be known as the day the world lost author Michael Crichton. Like Arthur C. Clarke, Crichton’s novels often dealt with new technologies, though usually delivered as a cautionary tale. Whether it be cowboy robots running amok in Westworld, or dinosaurs taking over Isla Nublar in Jurassic Park. In fact when I was in high school I read Jurassic Park after seeing the movie (like countless others) and it was that novel that rekindled my love of books, particularly those from Clarke and Crichton. Michael Crichton was 66 years old when he died, and while his family called his passing unexpected, he had been privately battling cancer. 🙁 He's one of the reasons I love dinosaurs. 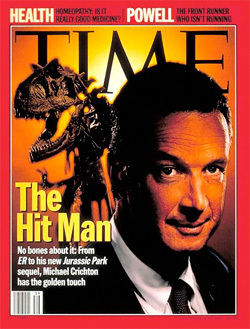 MIchael Crichton is my favorite author, and I'm real sad to see him go. My favorites are Prey, Jurassic Park, Sphere, Congo, Andromeda Strain, and Airframe.